Sausage lovers rejoice as British Sausage Week gives you the celebrate the great British banger! Karen is a big fan and introduces the week along with a recipe for a hearty, budget friendly and delicious sausage casserole. Not only do I love the humble British banger for its taste, texture and flavour, but I also rate it as a fabulous “frugal family meal plan” ingredient, and many a comforting “the week before pay day” meal has been made with a packet of sausages. Sausages come in many different shapes, flavours and sizes, and my top three favourites are beef, Lincolnshire and Cumberland sausages. The classics are always the best, but I do enjoy the diverse selection of other flavours that are on offer now, such as pork and apple, lamb and mint, pork with caramelised onion and hot and spicy with sun-dried tomatoes and chilli. 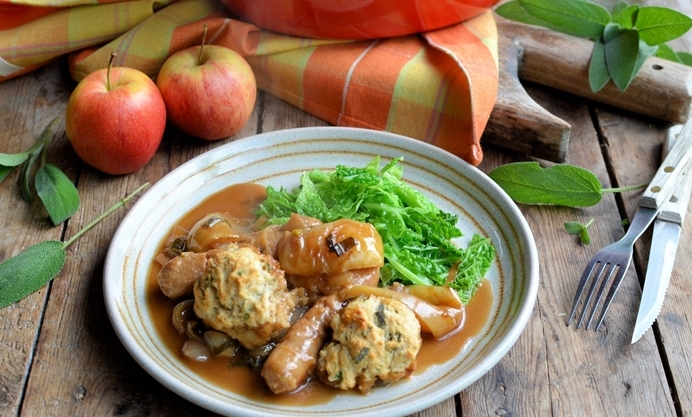 One of the best things about a packet of sausages is that you can make a very hearty and filling meal for all of the family and it won’t break the bank either, as I am happy to show with my recipe for sausage and apple casserole with herb-crusted dumplings today. Cheap and cheerful it may be, but it is my most requested meal by all the family, and as the weather starts to get more wintry, it’s a brilliant recipe to keep on hand, and it can be prepped and cooked in a slow cooker too – perfect if you are out at work all day. 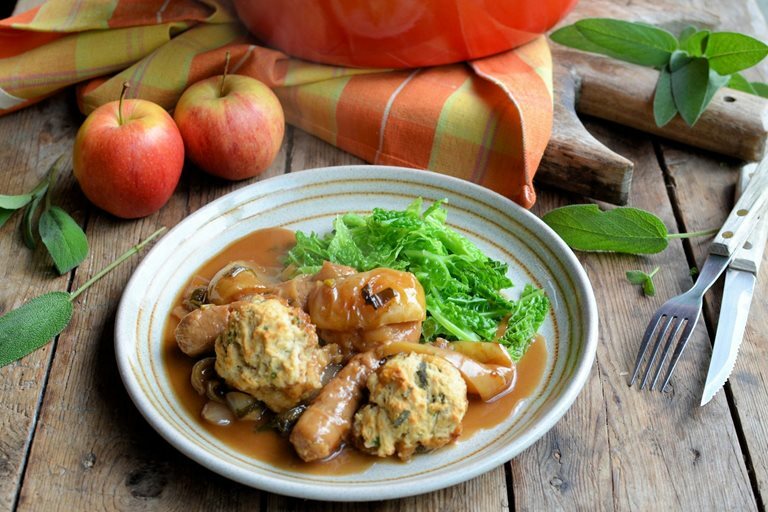 There is no need to serve anything else with this casserole, other than some steamed cabbage or other seasonal veggies, as the dumplings take the place of spuds; although some mash would always be a great addition if you crave bangers and mash! I have suggested using pork and apple sausages, but do use any bangers of your choice.